Win the battle 5 I had the opportunity to test McKee's 37 Fast Water Spot Remover last week and wanted to share my experience & results. The subject was a 2016 Jeep Cherokee loaner vehicle. It made the perfect candidate for this review. Loaner vehicles often receive very little love as they are passed from one customer to the other. I'd be hard pressed to imagine that this 1 year old loaner under 10k miles was ever polished, wax, sealed etc. so absent any paint protection, it was ripe for spotting. Needless to say, the vehicle was laden with a heavy blanket of sprinkler-induced water spots. The water spots were rough to the touch and covered a significant amount of the side panel. The directions indicate to apply a healthy amount of product to the affected area, ensuring its cool to the touch, followed by 1 minute dwell time. You can then either perform a full wash or wipe down of the effected area with a microfiber towel. I did a wipe down to one small section of the affected area, and the product easily removed the spots. However, I wanted to push the product a little harder, and by that I mean testing its ability to remove spots without any agitation at all. So I applied the product, allowed for the 1 minute dwell time and then rinsed the affected area with a hose. This process, absent any agitation by washing or wiping, removed the water spots. I was impressed. I of course followed up with a full vehicle washing. The product has a orange-vinegar smell to it. By no means offensive and easy to work with. I could easily see this as a staple product in a detailer's arsenal especially in the months where water sprinkling is prevalent. McKee's does recommend following up with either spray wax or some other form of protection. In this case I followed with Hydro Blue. In the condo complex I used to live in, the landscapers would constantly adjust the sprinklers poorly if I might add and inevitably my car would get hit 1-2 times per week. I since learned how to adjust them myself but played this "battle" with them all summer. We have moved to a home now but my point here is that I am sure there are many people out there is the same situation. Very few people likely have time to do a full wash before work after finding their car was spotted-on the night before, and that is where this product is key. If I were in a situation where I had to use this on a somewhat regular basis, I would likely get in the habit of Fast Water Spot Remover followed by McKee's Waterless Wash followed by McKee's Fast Wax. 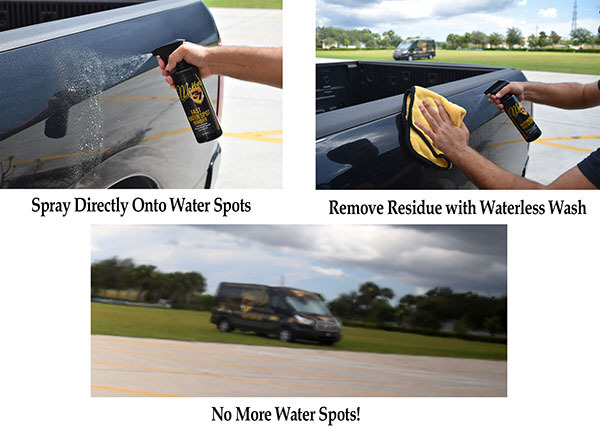 While this sounds like a lot of effort, it's really not considering removing water spots without this product would often involve a complete wash followed by a light polish or sometimes more. And you can do all this without a hose like on your lunch break. Pros:VERY easy to use - never wrestle with water spots again.